Crock Pot Cook up a Storm. 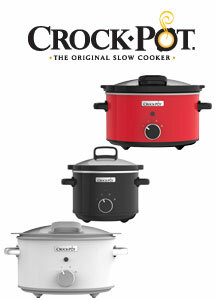 The new lines from Crock Pot will make cooking so simple. Models include the CSC046 manual slow cooker which features 2.4L capacity, the CSC037, which is equipped with the new detachable hinged lid for easy cleaning featuring a large 3.5L dish and serves 4. Crock Pot also brings you the new Duraceramic Sauté Slow Cooker, which comes with an Induction ready pot. The CSC038 is 4x more durable, scratch resistant, cooks 20% faster serves 5 from a large 4.7L capacity.